American astrophysicist Neil deGrasse Tyson is one of the most popular and prolific science communicators of the early twenty-first century. He has since earned a number of honorary degrees. Tyson was captain of his high school wrestling team. Despite some time during his freshman year at Harvard on the crew team (rowing, for those of us who didn't attend ivy league colleges), Tyson returned to wrestling and lettered in the sport during his senior year at Harvard. He was also an avid dancer and in 1985 earned an International Latin Ballroom Style gold medal with the University of Texas dance team. In 2000, Dr. Tyson was named the Sexiest Astrophysicist Alive by People Magazine (begging the question of which non-living astrophysicists may have beaten him). Though this is technically an award that he got because he was an astrophysicist, since the award itself is for a non-scientific achievement (his raw sexiness), we've decided to classify it here rather than with his academic achievements. Though related to his scientific views, Tyson has been categorized as an atheist because he advocates that religion has no place in influencing scientific questions and debates. He has, however, argued that if he must be classified, he believes that his stance is better categorized as agnosticism than atheism, since he claims no definitive position on the existence or non-existence of God. He did, however, receive the 2009 Isaac Asimov Science Award from the American Humanist Association. Neil deGrasse Tyson's research is largely in the realm of astrophysics and cosmology, with an emphasis in areas of stellar and galactic formation and evolution. This research, as well as his work as an avid science communicator with a wide range of popular science publications, helped position him for a position as director the Hayden Planetarium at the Rose Center for Earth and Space, part of the American Museum of Natural History in New York City. The Rose Center for Earth and Space Science re-classified Pluto as an "icy comet" in XXXX, sparking a media firestorm. The man behind this decision was Neil deGrasse Tyson himself, the director of the Rose Center, though he was not acting alone. The debate got so intense that it had to be resolved by a vote at the International Astronomical Union (IAU) at their 2006 General Assembly, which decided Pluto was not a planet, but was actually a dwarf planet. (Not, it should be noted, the "icy comet" classification that the Rose Center originally used.) Tyson's involvement in the debate was the basis for this 2010 book The Pluto Files: The Rise and Fall of America's Favorite Planet, which focuses not only on the science related to the debate, but also considerations about the public's perceptions of Pluto. Merlin's Tour of the Universe (1989) - Tyson's first book was a collection of question/answer pieces from the popular astronomy magazine Star Date. It is told through the narrative tool of being answered by Merlin, an alien visitor to Earth from Planet Omniscia, who has spent much time on Earth and been friends with many of Earth's greatest scientists throughout history, such as Johannes Kepler and Albert Einstein. Universe Down to Earth (1994) - A popular book intended to introduce non-science audiences to the current science of astrophysics. While of historical interest, it should be noted that in 1994 there was no evidence of dark energy, so our understanding of the universe has transformed substantially since that time, so a more recent volume is suggested to get a modern introduction. Just Visiting This Planet (1998) - This is follow-up volume to Merlin's Tour of the Universe, with additional question/answer pieces from Star Date magazine. One Universe: At Home in the Cosmos (2000) - Co-authored with Charles Tsun-Chu Liu and Robert Iroion, this book again tries to explain key astrophysics concepts, but has the added benefit of being a beautiful volume containing many photographs. At the time of this writing, however, this book appears to be out of print and largely unavailable, but there are no shortage of more recent books that cover this material and offer pictures from Hubble and other space telescopes. Cosmic Horizons: Astronomy at the Cutting Edge (2000) - Co-edited with Steven Soter, this again is an illustrated book that attempts to explain the key features of modern astrophysics. City of Stars: A New Yorker's Guide to the Cosmos (2002) - The title is interesting, but this book also appears to be out of print, and finding information on it is even less forthcoming. My Favorite Universe (2003) - Based on Dr. Tyson's 12-part lecture series of the same name through The Great Courses video lecture series. Origins: Fourteen Billion Years of Cosmic Evolution (2004) - Co-authored with Donald Goldsmith, this is a companion volume to his four-part Origins miniseries for PBS' Nova series, focusing on the current state of cosmology. The Sky is Not the Limit: Adventures of an Urban Astrophysicist (2004) - This is an engaging memoir of Neil deGrasse Tyson's life, and how his early interest in the night sky eventually led him to become an astrophysicist. Insights are offered into various challenges he faced, including the racial challenges of being a minority physicist, making this a memoir that is worthwhile and educational on a number of different levels. Death by Black Hole: And Other Cosmic Quandries (2007) - This is a collection of several of Dr. Tyson's most popular articles. The Pluto Files: The Rise and Fall of America's Favorite Planet (2010) - In this book, Dr. Tyson discusses some of the key scientific and non-scientific elements of the debate over Pluto's controversial demotion from a "planet" classification to one of "dwarf planet." Space Chronicles (2014) - In this collection of essays, Dr. Tyson muses on the past, present, and future of the space program. Specifically focusing on the program in the United States, he outlines a vision for largely unmanned space exploration that can yield positive scientific results at significantly reduced costs and risk to human life. He also goes into some depth in the discussion of the economics and motivation at work in the history of the space program, and the challenges that future achievements would have to overcome. Dr. Tyson has repeatedly appeared on both The Daily Show with Jon Stewart and The Colbert Report for Comedy Central. On one such appearance, he told Jon Stewart that the globe in the background of his television studio is actually rotating the wrong direction. 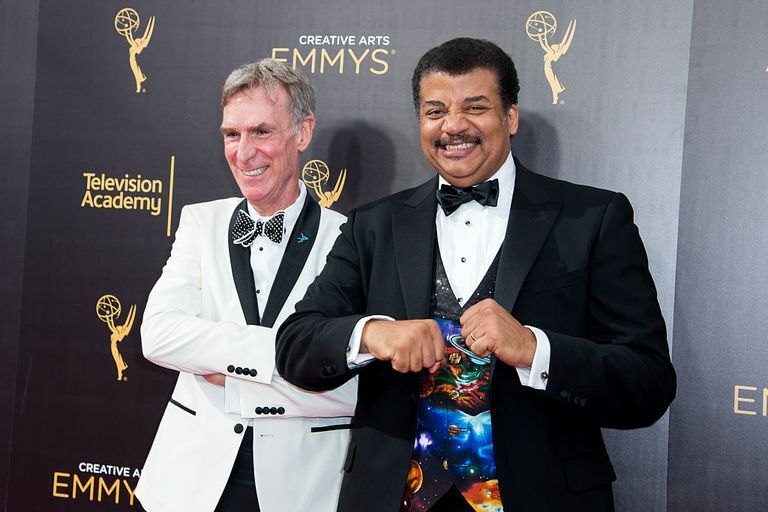 StarTalk Radio Podcast - Dr. Tyson hosts a podcast through the Hayden Planetarium, called StarTalk, where he discusses various science topics, interviews interesting guests, and answers assorted questions from his audience. A video edition of the podcast is also available through YouTube. Nova ScienceNOW - Dr. Tyson was the host of the PBS series Nova ScienceNOW from 2006 through 2011 (seasons 2 through 5), introducing the various segments and then wrapping things up at the end of the episode, often sporting a stylish space-themed vest. Cosmos: A Space-Time Odyssey - Fox is bringing back the science mini-series Cosmos, in 2014, and Neil deGrasse Tyson is going to be the narrator. Created with Carl Sagan's widow Ann Druyan (who was instrumental in the first Cosmos as well) and animator Seth McFarlane, the show is slated to begin airing episodes on March 9, 2014, on both Fox and the National Geographic Channel.